Vietnam is a country that is certainly appearing on the tourist itinerary of many more people over recent years, and one of the reasons for this is that it is a real hotbed of archaeological sites and sites of historical importance. From areas of exceptional natural beauty through to historic fortresses and Buddhist temples, Vietnam is full of locations that will delight and astound. The recognition of a site by UNESCO is often one of the key indicators that a place is very important within a specific region, and here are some of the best sites in Vietnam. The Sanctuary is located on the east coast of Thailand and is a complex of Buddhist temples from a variety of periods which are noted for their architecture and the carvings to be found here. The earliest date from the fourth century, and tens of temples were built over the following thousand years on the site, with the most recent temple here dating from the fourteenth century. This is one of the most important Buddhist archaeological sites in Asia, and it is the superb quality of the carvings that were cut directly on to the red brick that helps the site to stand out. One of the most damaging events in the recent history of the site happened during the Vietnam War, where the forces of the United States destroyed many of these historical sites during sustained bombing. Among the beautiful carvings to be found here, many of the craters where the bombs fell can also be seen. Ha LongBay is one of the most famous sites in Vietnam, and the thousands of limestone islands emerging from the waters of the bay really make this a very special site. The bay lies on the north east coast of Vietnam, and these sites are excellent examples of Karst limestone formations. One of the reasons that Ha Long Bay is such a famous area is that it appeared in the James Bond film ‘Tomorrow Never Dies’, where the numerous small islands were shown up very well in the film. As well as being important because of the rock formations in the bay, the area was also recognized because of the fish, marine creatures and birds to be found living in the area. Today Hue is a reasonably large city on the east coast of Vietnam, but on the banks of the PerfumeRiver near to today’s settlement is the historic is a historic citadel and forbidden city where only the most important people in the country were allowed access. The grand stairway and the historic buildings around the citadel still give the impression of an imposing city. There are also a number of tombs for some of these emperors to be found along the banks of the river, and make this site a must visit for anyone who will be spending some time in the area. The city of Hanoi is one of the most important cities in Vietnam today, and one of the indications of the history of the city is the citadel of Thang Long, which is one of the old names for Hanoi. For the majority of the old imperial citadel there are only ruins remaining, as the majority of the buildings, including the KinhThienPalace, were destroyed by French during their occupation of the city. There are a few remaining remnants of the citadel that can still be seen, including the North Gate, but most impressive is the Flag Tower of Hanoi, which was surprisingly spared. This National Park is one of the most impressive areas in the whole of Vietnam, with a number of mountainous regions and river valleys that make it a wonderful place to visit. It is the network of caves and underground rivers that have helped to gain recognition for the area, with the formations of stalagmites and stalactites being discovered. The area is also revered by cavers as the area has one of the longest underground rivers in the world, and in these underground caves are some of the best sandy beaches ever found underground. Thailand is one of the most interesting and diverse countries in Asia, and with regions ranging from low lying river valleys to high mountainous areas, it is a great place to visit. The majority of places to be found in Thailand are actually quite small, with only eleven cities with a population of over a hundred thousand people. As a city, Bangkok dominates the rest of the country, but this is not to say that the rest of Thailand isn’t worth a visit, with many fascinating places to be found across the country. As the capital of Thailand, Bangkok is the only real city in the country to have a true metropolis style district of skyscrapers, yet the city still has a number of parks and green areas around the city. One of the real experiences for people visiting the city is that it is one of the few places in the world which has a true water bus network, and a trip on one of these during rush hour is certainly an experience. Bangkok is also particularly famous for its vibrant nightlife, with a series of nightclubs and venues to be found throughout the city, particularly in the popular tourist areas. Bangkok is also well known for its exceptional Buddhist temples and the wonderfully ornate GrandPalace. Although the palace is still in use for ceremonial purposes, it now boasts a museum and is largely open to visitors. The city of Phuket is the largest city on the island that shares the same name, and is one of the most popular tourist destinations in the country. The coastal city is within easy reach of many beautiful beaches and natural forests, and enjoys consistently warm weather throughout the year. However, it is also known for its tropical monsoon climate that means the best period to visit the city is between December and April when the chances of being caught in the significant rainstorms are reduced. The city did suffer from the effects of a Tsunami in 2004, but the hotels and tourism facilities in the city have all been restored. The city of Chiang Mai is the most important city in the north of the country, and is set in a mountainous region that has some truly beautiful areas. 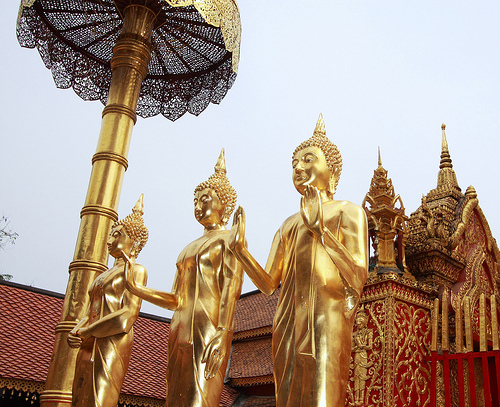 With over 300 Buddhist temples and religious buildings to be found throughout the city, there is a wealth of sightseeing to be done with Wat Chiang Man being a particularly popular site with visitors. With so many high mountains surrounding the city, it is natural that many visitors to Chiang Mai do so to enjoy the surrounding countryside, with the DoiInthanonNational Park an important destination. There are also many organized trekking groups that take visitors out into the wilds around the city and guiding them on visits to some of the hill tribes that still live largely untouched by modern civilization. Although Buri Ram is by itself quite a small town, it is the nearby PhanomRungHistoricalPark that makes it of great interest to visitors. The exquisite temple at Phanom Rung was built during the period when the area was a part of the Khmer empire, and is located near an extinct volcano. The large temple building has been significantly restored, and was a Hindu shrine dedicated to the god Shiva. Another city that owes its inclusion to its vicinity to an important historical site is Udon Thani. The city itself does boast a number of interesting Buddhist temples, but it is the nearby archaeological site of Ban Chiang that gives it real significance. The Bronze Age settlement was discovered in the 1960s, and some of the best discoveries of Bronze Age pottery were found at the site. Many of these are on display at the BanChiangNationalMuseum, and include some particularly attractive pottery bearing distinctive swirl designs. Tourists should know that one of the great features about Japan is that although it is a largely industrialized and developed country, it has also protected many of its most beautiful and important natural sites using national parks. Being a nation that is made up of a number of islands, the various surroundings and altitudes of the different areas of Japan mean that there are many different types of natural areas that are included in these national parks too. Travelers who are looking to enjoy a holiday including some of the natural beauty of Japan, you can book any Tokyo hotel near one of these national parks. 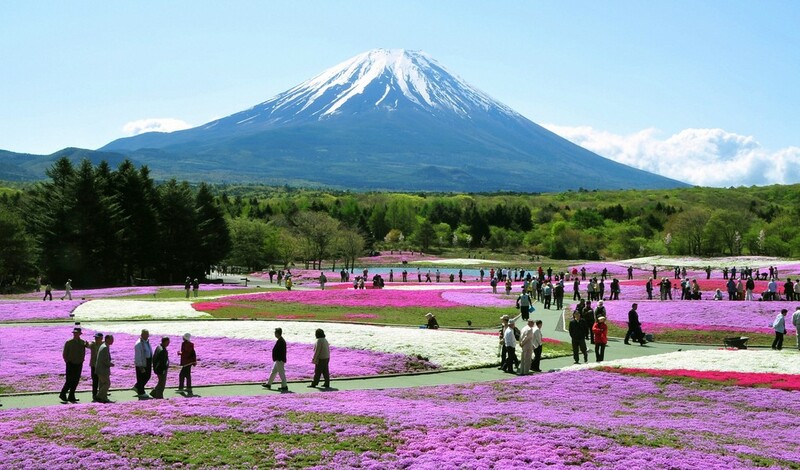 Probably the most famous natural feature in Japan is the mountain that has graced a thousand postcards, and Mount Fuji is at the heart of this national park. However, it can also boast a number of other sites of great interest for visitors, and the Izu islands that lie off the coast near Mount Fuji are especially attractive. The islands themselves are green an lush islands that are crammed with flowers, and the waters around the islands are particularly popular as sites for scuba diving. Izu Oshima is also home to a volcano that erupted as recently as 1990. The magnificently named ‘Great Boiling Valley is another of the attractions in this national park, where the sulphur vents and hot springs bubble away beneath the visitors on the walkway. One of the local delicacies is the hard boiled eggs that are boiled in the waters of the valley. Another of Japan’s most beautiful and scenic national parks lies at the heart of Honshu island and although its scenery is stunning, it is the marvelous temples and shrines in the area that make it truly special. The Shinto shrine of Nikko Tosho-gu that lies within the park is designated as an UNESCO heritage site, and the stunning five storey pagoda is filled with ornate carvings and religious symbols. The Buddhist Temples of Rinno-Ji also make up one of the important sites within the national park. This complex of temples lies in a particularly remote area, and this made it an ideal site for monks looking for a simple life. The site is also home to the mausoleum of the third Tokugawa shogun. The inland sea of Japan contains over 3,000 small islands, and many of these have tourist sites and also important shrines and sensitive natural areas. Although the sea itself is known for its whirlpools, it is generally considered to be a calm sea with a mild climate. Probably the most famous site in the SetonaikaiNational Park is the Itsukushima Shrine, which has been an important religious site for many centuries. The shrine itself is a spectacular building at high tide, as it has been built on piers that make it look as though it is floating on water during high tide. One of the interesting aspects is that it is considered so sacred that it cannot be soiled by births and deaths, and neither has been registered in the area for over a century. Considering that Japan is considered among the most volcanically active areas in the world, it is no surprise that this national park in the south of Japan does have the volcanically active MountUnzen at its heart. The last major eruption of the volcano happened in 1991, but this site is still considered important among those that study volcanoes. Many of the visitors to the Unzen-AmakusaNational Park do so because of its strong associations with the early years of Christianity in the country, where worshippers had to keep their religion a secret.